The Operation Series of books are fast-paced fiction crime thrillers, suitable for YA (Young Adult) readers and used in some schools as 'required reading'. In 2001, DJ Stutley introduced her fictional hero, Detective Sergeant Scott Backer, to the world in Operation Foxtrot Five. She quickly picked up a following of dedicated and loyal fans who have eagerly awaited the release of each book. The author's writing style has the unique ability to cross over into the adult readers market, and over the years her books have been sought after by an increasing number of adults. 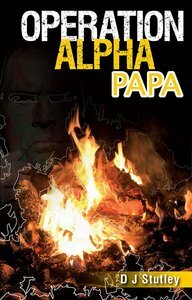 About "Alpha Papa (#03 in Operation Series)"
When 15 year old Keryn Smith becomes involved in a missing-persons case, it causes friction between herself, her family, and their new Court Appointed Guardian, Detective Sergeant Scott Backer. Scott knows she's involved in some way, he just has to work out how. Following the death of their parents in a level-crossing accident, the four Smith children go on the run rather than be separated. Detective Sergeant Scott Backer is called in to find them. He manages to catch Doug (17), the eldest boy, but when the teenager refuses to co-operate, the detective is reluctant to reveal the real reason he's tracked the family down. When Kelly Smith (13) first meets Joanna Acosta, she is intrigued by the new girl's secretiveness and timidity. But as soon as Kelly befriends Joanna, she becomes entangled in an international saga involving bodygurards, electronic surveillance and a mysterious 'Death Squad'. Added to that Kelly's guardian, Detective Sergeant Scott Backer, is now on the case and he is keen to put a stop to their friendship..
With winter closing in, homeless fifteen year old boy, Shaye, is desperate for somewhere safe to sleep. He breaks into an elderly ladies home and soon comes face to face with Detective Sergeant Scott Backer. Who is this fifteen year old boy, and what is he hiding?